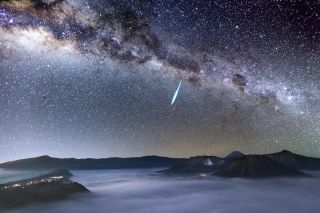 Justin Ng of Singapore captured this view of a bright Eta Aquarid meteor hurtling across the night sky over Mount Bromo, on the Indonesian island of Java. If you missed out on seeing Halley's Comet during its last Earth flyby in 1986, don't despair — you can spot tiny pieces of the icy wanderer overhead this week. This year, the shower will peak in the predawn hours Thursday and Friday (May 5 and May 6). From mid-northern latitudes, the radiant — the spot in the sky from which the meteors appear to emanate — rises at about 1:30 a.m. local daylight time, scarcely 2 hours before morning twilight begins to interfere. But don't give up hope if you live north of New York City. You still have the chance to see a very special kind of meteor — an Earthgrazer. Earthgrazers skim the top of Earth's atmosphere like a stone skipping across the surface of a pond. They appear when the radiant of a meteor shower is near the horizon, and meteoroids streak horizontally overhead rather than down through the sky. Earthgrazers are rare; an hour of watching might produce one or two at most, but that's plenty. These meteors are sometimes colorful and gracefully slow, and people who are lucky enough to see one talk about it for years. During the 2001 Leonid meteor shower, I was stationed just outside of Benson, Arizona, and caught sight of an Earthgrazer. It bolted straight up out of the northeast and took about 10 seconds to traverse nearly the entire sky, passing almost directly over my head in the process. The meteor did not leave a streak or trail; rather, it appeared as a small, white glowing ball. I felt like an outfielder at a baseball game watching a home run sail right over my head. Looking for Earthgrazers is simple: Spread a blanket on the ground, lie down and look up. A reclining lawn chair facing southeast works just as well. Eta Aquarid Earthgrazers streak overhead, flying generally southeast to northwest. The Eta Aquarids remain active at about one-half peak strength for a couple of days before and after the maximum. Conditions this year are excellent; the moon is absent from the predawn sky for more than a week around maximum. Editor's note: If you snap an awesome photo of an Eta Aquarid meteor or any other celestial sight and would like to share it with Space.com and our news partners for a story or gallery, send images and comments in to managing editor Tariq Malik at spacephotos@space.com.